In the summer, children love to spend time in the sandbox. Many adults enjoy the peace and tranquility of gardening. If your household includes a cat that also enjoys time outside, a sandbox or garden is often considered an attractive outdoor litterbox. Your cat's natural preferences for elimination includes soft sand- or soil-type material so the attraction to these areas can be annoying or even hazardous to your health. Fortunately, there are methods that can be used to discourage this unwanted behavior. If the above suggestion still aren't deterring you determined feline, how about considering a space in the yard/garden that only your cat will enjoy? A small space with cat-attractive plants could be established in a quiet corner of the yard away from children’s activities. Common choices for plants would include catnip and catmint. Both are easy to grow, and provide attractive foliage for the yard. Take an extra litter pan and dig it into the soil so its surface is flush with the ground. Add a little sand and a handful of dirt. Since cats prefer privacy for their eliminations, a quiet hidden spot such as this may do the trick. It will, however, need to be cleaned like any other cat box. One word of caution, both catmint and catnip produce beautiful fragrant flowers that are attractive to bees. 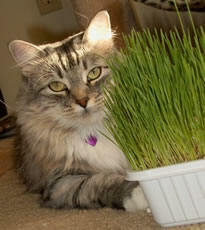 To prevent your cat from being stung, remove the flower stalks before they open with a gentle pinch. Don't forget to dry some catnip for your cat as an extra treat!